I found out that having a snow day can be extremely productive. Today, I cleaned, ran 8.5 miles, scheduled clients, worked on programs, made lunch, dinner and these beauties. Not a bad day. Not a bad day at all. I have a bunch of strawberries that I need to use, so I started searching for something to pair with white chocolate. 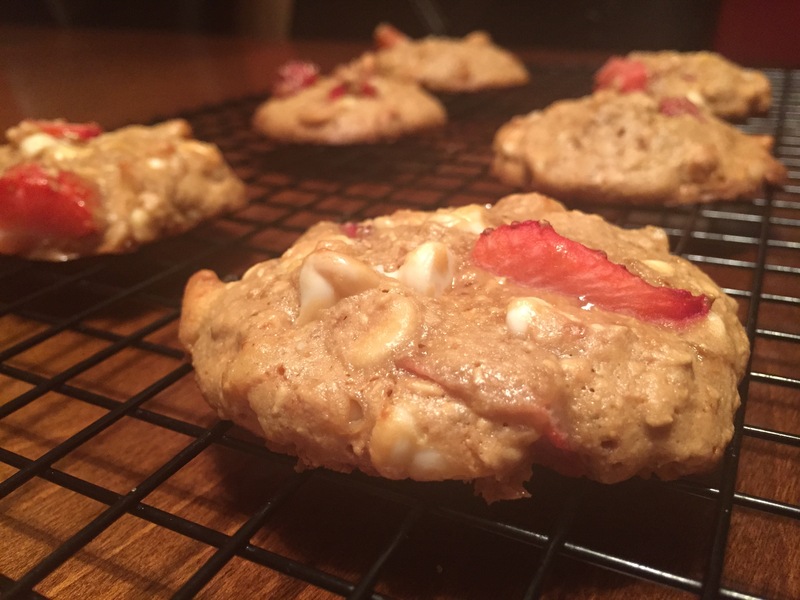 Rarely do I use fresh fruit in cookies – usually it’s dried, so this was a little different from me, and it was GREAT! If you make these, they all need to be eaten within 2 days. Definitely not a problem for me…I might have eaten 4 of these and then drank milk straight from the container. Oops. Lightly spoon flour into a measuring cup; level with a knife. Combine flour, oats, baking soda, and salt; stir with a whisk. Place sugar and oil in the bowl of a stand mixer; beat at medium speed until well blended (about 3 minutes). Add vanilla and egg; beat well. Gradually add flour mixture, beating until blended. Add strawberries and chips; beat at low speed just until blended. Yeeeesss Jen!! Try them! So good! Let me know what you think!